Kat Tanner (aka Kathleen Caravel-Tyson) is in desperate need of a husband. Until recently her billionaire heiress status and ties to Caravel Pharmaceuticals has been kept under the radar. But, with the health of her father deteriorating, and a greedy family member set to make a grab for Kat’s inheritance, her impending situation is in need of some immediate attention. Dan O’Malley knows Kat isn’t for him. With different views on relationships and a friendship that has been strained for years, he is used to her avoiding him. So, when she asks him for a favor, he knows she has to be in a precarious situation. What happens when two friends who have been ignoring a connection they have had from the very beginning try to enter into a marriage of convenience? Everything. Language warning! I have seen numerous warnings from Penny Reid about the language in this book. So if you are offended by the word f*ck, you definitely need to stay away. I myself had tears in my eyes with every last creative conglomeration of the 213 f*cks that were to be found in this book. They were simply glorious… and hilarious. When they first met Kat immediately recognized her attraction to Dan. They had a great friendship and seemed to be on the verge of something more. Until Vegas. With several years of avoidance and stilted conversation between them, Kat thinks it is very unlikely that Dan will agree to marry her. Since the revelation Kat gave Dan in Vegas, he had decided to give up on pursuing a relationship with her thinking they wanted different things. But, the attraction was never something that went away, and now that Dan has Kat in his life again, he will do anything he can to help her. Including working with her on letting her past go and helping her find her real self. Gah! I absolutely loved this book. The story was, as usual, interesting and packed full of knowledge that makes you come away feeling like an expert on it all. Kat has a lot of issues she needs to work on, and they are all approached in a realistic and straightforward manner. She could not have found a better man to stand by her side and help her through her self-viewed inadequacies. Dan… I could not be more in love with Dan. In a book that is great on it’s own, Dan is the foul mouthed cherry on top. Every hilarious viewpoint and name he called someone had me laughing out loud to myself like a complete lunatic. And then his Mom… oh man, she was writing perfection. 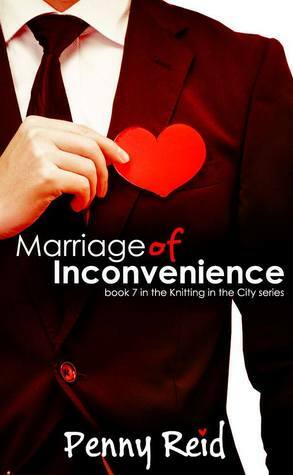 This book is supposed to be the final book in the Knitting in the City series. This series featured an incomparable cast of characters whom I have grown to love. All I can ask of Penny Reid with the last of the ladies in the knitting group having found her HEA is… spin-off?! Ava and Desmond, please? !